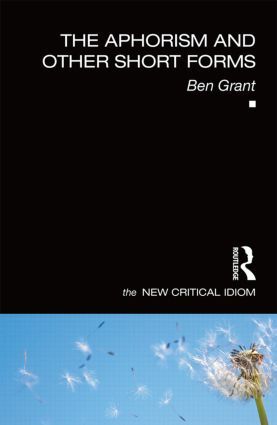 Exploring all the key aspects of the form, Ben Grant guides readers through this large and lively area in a wide-ranging and critically informed study of the aphorism. Ben Grant teaches English Literature at the University of Kent, UK. He is the author of Postcolonialism, Psychoanalysis and Burton: Power Play of Empire (Routledge, 2009).